Despite the late start in the season and with some encouragement from my fellow community gardeners, I’ve decided to try seeding a few things in the newly launched plot. I tried radishes, beets, carrots, spinach, lettuce, and a number of other items in my temporary garden earlier this year (when I didn’t think I’d be getting a spot at 16 Oaks Community Garden), but they just never took off, for whatever reason. Or, as in the case of the radishes, they took off running and completely bolted! I’m hoping to have better luck this time. It will help that the community garden is in close proximity to where I live so I can check on it more regularly — in contrast to my first garden attempt, which is located in a friend’s backyard a half hour’s drive away. When transplanting the nursery seedlings I bought, I left 2 open spots for seeding, one on either side of the box. This time I’ve seeded 2 kinds of radishes, 2 kinds of beets, some lettuce and some spinach. This entry was posted in 16 Oaks Community Garden, Urban Gardening and tagged community gardens, lettuce, radishes, spinach on July 21, 2009 by local delicious. If you don’t have the time, patience or sense of adventure to grow a garden in your spacious yard but hate seeing all that real estate go to waste, how about having someone come in, work your garden for you, and leave payment in the form of a regular supply of fresh, organic produce? There are a variety of creative gardening partnership options to choose from, including sharing or leasing. Check out City Farm Boy, Kitsilano Farms and Sharing Backyards for more information. This entry was posted in General, Organizations, Urban Gardening and tagged community gardens, Kitsilano, Kitsilano Farms, Vancouver on July 20, 2009 by local delicious. Have a couple of hours this Saturday and want to get down and dirty? How about volunteering to help maintain gardens for the Edible Garden Project. The mission of the project is to create a network of communities where locally grown food is collected and distributed to organizations that provide food to low income families and individuals. The Edible Garden Project connects homeowners with gardens who want to donate a portion of their harvest, people who have under or unused garden space and would like to cultivate this land for growing food, and volunteers who want to contribute to the growing, sharing, and learning around locally produced food. Meet up with other gardeners, get great garden advice, and help the community. This entry was posted in Events, Organizations and tagged community gardens, Edible Garden Project on June 27, 2009 by local delicious. Last summer, I decided to try my hand at patio vegetable gardening. Oh, nothing ambitious, you understand — just some tomatoes. I signed up for a seminar on growing heirloom tomatoes through Slow Food. I got lots of great information and decided to give it a try. How bad could it possibly go? After all, I have neighbours who have beautiful vines of luscious red jewels in their gardens. How did my experiment turn out? About as well as my first attempt at chili (read: not well). Apparently, my patio is completely void of veggie-growing sunlight. Instead of the tomatoes my neighbours were enjoying, I got two – yes two – little, hard green tomatoes. Not exactly the harvest I was hoping for. This year, still determined to grow something, I’m considering renting a plot at the community garden. I was initially concerned that it would be difficult to locate one but a handy website, City Farmer, simplifies the search. The site offers a list of gardens divided by city, each with location and contact information. There are even gardens designated as “organic”. I must admit, I’m a little intimidated. Will I be able to fill my plot? Will any of it grow? What if more veggies grow than I can possibly eat? Despite my apprehension, my belief that the simple act of growing our own vegetables helps safeguard the environment, build communities, and connect the grower with their food source pretty much insists that I, at least, investigate the possibility of renting a plot. I will be visiting some of the gardens in my area over the next weeks and deciding where and if I will begin my new experiment this spring. This entry was posted in Urban Gardening and tagged community gardens, growing vegetables, Slow Food on April 2, 2009 by candrina. Looking in on my friend’s community garden this summer and harvesting a fabulous assortment of veggies – from lettuce to peas to giant, juicy field cucumbers – inspired me to want to share the harvest, feed people, connect with people. I’ve noticed a hint of that from others, too. One day at the farmers market this summer a woman whom I had inadvertently butted in front of, excused my error, let me in line ahead of her, offered me some of her fresh cherries as she raved about them, and proceeded to tell me which booths were best for various crops. She was delightful! I think it has something to do with working the land and enjoying its fruits. It just seems to bring out the best in us. And it isn’t only me. One of the other gardeners at my friend’s community garden lent me tools and enthusiastically took me on a tour, pointing out all the amazing wonders in everyone’s garden. Immaculate rows of greenery in one. A large, beautiful artichoke. A perfectly ripe, plump cabbage. And then he brought me carrots from his own plot to share with me. This entry was posted in General, Urban Gardening and tagged community gardens on September 30, 2008 by local delicious. I had a chance to look after a friend’s community garden this summer while she was traveling overseas. It’s inspired me to sign up for a plot at my local community garden. Only those who have known me a long time will appreciate just how far I’ve come. Then a couple of years ago I landed a choice top floor apartment with a 12×24’ deck and overnight I became a gardener. I recruited a couple of experienced gardener friends, headed out to the local nurseries, and came home with significantly more than the 3 pots and suitable plants I’d set out to buy. Okay, I went a little crazy. Two additional trips later, I was fully and truly hooked. And now I’m signed up for a community garden plot. Who ever would have thought? I’m a little disappointed to discover I’m 54th on the list, mind you. It suggests to me that we should have a few more of those around. 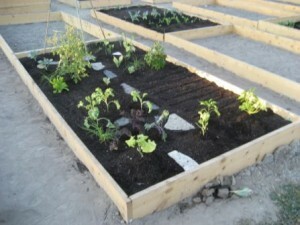 This entry was posted in General, Urban Gardening and tagged community gardens on September 27, 2008 by local delicious.